Some of the links in this post are affiliate links, which means that if you buy the item using the link, you’ll allow me to earn a small commission for the same price that you would pay by going to that site directly. That would be a wonderful way of saying Merry Christmas to me, without it costing you a dime. So THANK YOU in advance for your support! In the last post, we talked about some suggested Gifts For Everybody and some suggested Gifts For Her. 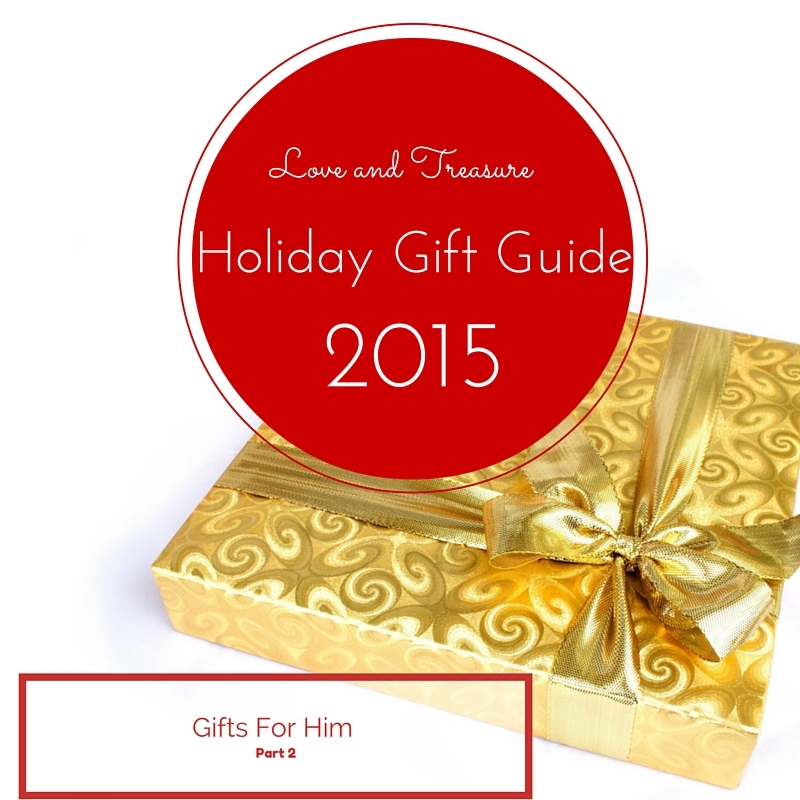 This week, I’ll be focusing on Gifts for Him. Let’s admit it, shopping for guys is often the least rewarding person to shop for. Don’t mean to be mean or anything. The reason that I’m saying this is because even though they might “love” one of your gifts they’re not going to express it the way you’d like them to. (Meaning, they’re more mellow/subtle than ladies in expressing their gratitude). Think about it…. whenever Oprah had Her Favorite Things Show or she gave away cars, (CARS!) most often, the people who were beside themselves were… ladies. Yeah, there was that one guy who was on his knees and revering the floor he was standing on, but other than him, I don’t remember any guy freaking out over the THOUSANDS of dollars that Oprah gave them in gifts. Also check out what probably is the best surprise on TV… the time that she had the car giveaway. You want to know something? I totally agree with Oprah, it’s not the things that make moments like these special, because for all we know these things might be a thing of the past or collecting dust in the closet in all of these lucky recipients’ homes. But the experience of being on the Oprah Winfrey Show (something that I aspired to for YEARS) and then being on Oprah’s Favorite Thing’s show? Now THAT’S sooooo special, that even watching these videos makes me cry. I feel the emotions the people are feeling. I feel the anticipation, the out-of-breathness, the “OMG!! factor.” It gets me every single time. Lame, I know. But would a guy do that? Would he cry over someone else getting things or a trip? Nah. I don’t think so. But who’s to blame guys? There aren’t that many cool things for guys… and it’s no wonder that the kinds of gifts that they receive year after year are often very similar. So similar in fact, that they expect them. They can almost read minds when it comes to what they’re going to get as gifts throughout the year. (I just wish they could read their lady’s mind more often… just saying). They’ll be really good at guessing, unless of course… you can really manage to shake it up for them. At least shake it up a little. (After all, when you ask them, what do you notice that’s new… they can hardly ever get that right… and nope, the 20th guess doesn’t count). This is especially fun when there is a new one out on the market. But if for some reason they’ve never gotten the one that they have, perhaps you can get them one and it won’t be as expensive. Personally, my favorite game console is the Wii (but then again, I’m a lady). But actually, you know why I love the Wii so much? Because I’ve actually gotten a Nintendo for one of my Christmases. And my brother and my sister have gotten their own Nintendo’s for Christmas, too. And OHHH the fun we had! To date, it’s the BEST reason I’ve found to voluntarily lose some sleep. and stay up late. (The other is taking care of a baby, but that isn’t always that we would volunteer for every night, especially when you’re only getting 2 hours of sleep per day). One other thing that I like about Nintendo is that overall, it seems to be more family-friendly than the other game consoles. The games aren’t that violent… and the quality is great… you don’t need it to be too lifelike to the point that it’s gory. The best perk about getting a game console is that you’re likely to participate in the fun! You can always add some entertainment to his life. And to yours. So, here are some of my favorite games that may not necesarily be what he would chose but which are undoubtedly fun (even though he might never admit it). Love this game. It’s my favorite game of all time. Yeah, that’s an option, but who would really, really, like REALLY want it? And by that I mean, who would be dyyyyyying to get it? Unless you’re a teen…and that’s okay, too. But my question is… how often would the gift recipient really use it? Like three times a year: on Christmas, on New Years and on 4th of July? To me, it’s like flying a kite… but if you suspect your guy would really be into it, you might consider an entry level drone. One model that seemed to fit those requirements was the Discovery HD+ Upgrade Drone. See if you like it. So which cologne should you get? That, my friend is something that only you can decide. Go with the scent that you know they enjoy or the scent you enjoy. Although it might be unconventional to order cologne online, if you know that you’ll like or he’ll like the scent you want to get him, Amazon offers substantial cologne discounts. OR you can skip the gift card and get him…. Get him something that’s in his go-to style or something nice that you would like to see him in more often. Speaking of, blazers are always nice. They dress up whatever he’s wearing. Apparently guys are always up for jackets, shirts sweaters and cool shoes. An actual boxed DVD set would be great. This would especially work if he’s more tangible and a bit more traditional (I don’t think that liking DVDs is old fashioned, personally). Or if he’s more of a minimalist and more of a digital guy, perhaps you can get him his favorite show/series on iTunes. Hopefully, it’s not The Walking Dead. Nothing against them (well maybe, yeah I dislike how there’s more violence in that series than there are calm parts in it even though I’ve never watched a full episode and have only seen it out of the corner of my eye)… but that series is definitely not my cup of tea. Did you know that nowadays people can steal money from you without touching you, without enterring your home, hacking your home network, messing with your investments or robbing the bank? They can steal from you SIMPLY by passing by or them simply passing you by. Literally! Thankfully, there’s this groovy card protector called SignalVault which I saw it on ShartTank. It taught me that people can steal from you by being in their vicinity which is actually quite a broad area. You could even add a wallet… to make the gift even better. So, not all of us have an internet capable phone, yet. Therefore, relying on our phones, iPads or even our iPods to listen to music in the car is still a thing of today. If you want to play music or podcasts on your non-wireless enabled car from your phone… then you need this. You can either go the wireless route or the wired route. Either way, with a wireless FM transmitter radio adapter car kit, like this Avantek model you’ll make your trips more enjoyable. This would be ideal if the guy in your life has a business. Ideal for the creative guy in your life. For a nice deal available through Black Friday 2015, visit the Adobe Illustrator webpage. Even if you miss this deal, you’ll get access to the latest Adobe Illustrator Feature using the official Adobe site. Perhaps the guy in your life is interested in a language. You can even get him software for tax purposes, especially if he thinks that he should forever let someone else handle his taxes for him. He might feel empowered and more knowledgeable knowing that he can do them himself. And yes, you can get a head-start on the taxes that you’ll need to follow next year. Yes jewelry for guys, why not? If your marriage bands are gold, maybe you can get him a silver or white gold ring. Or vice versa. Variety, you know? Often, men outgrow their desks and a nicer, sleeker or more sturdy option is in place. Do your own shopping at your favorite furniture store and go with furniture brands that have proven to be high-quality for you. Just for fun, take a look at this desk. Isn’t this one of the coolest desks you’ve ever seen? Plus, it’s hard to have a messy desk with this one. You can buy him a piece of electronic equipment, novelty item, garage tool or sporting equipment from his favorite store. Use his hobbies and interests as a clue to know what to get him. Let me caution you though, that just because the guy in your life likes Star Wars does it mean that he’ll like any and every Star Wars item out there. Use your judgement to decide whether the item is sooo cool that he would actually buy it for himself. There are guys who care about the way that they look. There are also guys with dry skin who need a little bit more TLC (tender, love and care) who just don’t know how to provide themselves with some. Therefore, as part of this Love and Treasure Holiday Gift Guide 2015, I want to share with you a kit that two important men in my family really like. It’s the Anthony Logistics For Men The Perfect Shave Kit. It’s not often that one man likes it so much that he shares it with another man as part of a Christmas gift. Yet this product is loved in my family. Do you have any awesome gift ideas for guys? If you missed the prior Love and Treasure Holiday Gift Guide 2015 in which I shared the Gifts for Her and Gifts for Everybody Teenagers and Up, you can read it here. And, like I said last time, even if you dislike all of my gift ideas, or you want to buy a few or all of your gifts on Amazon that you had already planned to give, since I am an Amazon affiliate, feel free to use this link to do all of your Holiday shopping and purchases year-round… and you’ll be supporting this blog in the process).